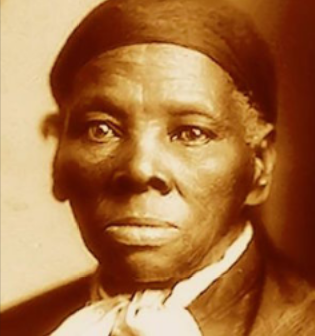 i can’t stop thinking about Harriet Tubman! i think about all the resources she did not have at her disposal – grants, organizations, markers and post-its, masses, privilege, a copy machine, social media, social norms, a job that could be done with recognition and safety. she did not have a perfect language with which to critique her oppressors, a quick way to travel, time to suffer fools. she had a vision (my people are free), a theory of change (i will physically lead to freedom those who know they are slaves), a gift for adaptation (the underground railroad was about finding the next open space in a series of precarious moves across a deadly chess board) and her body. i wonder if she dealt with people who were made so heavy by their own sense of being victim that they could not take the first steps north. i wonder what happened when she faced dissent, someone who questioned her leadership. if there were people who would follow her for a week and then say they’d found a better route, a better map in the sky. when did she tell people about her episodes, her disability? how did she trust each group of frightened strangers with her vulnerability and freedom? did she ever feel imposter syndrome – ‘oh what do i know about the way to freedom, i’ve only been that way twice?’ if she ever wanted the recognition of the name Moses, if she just longed to do her work unseen. how did she survive the heart betrayal of her husband, who found another wife while she was working on his freedom, who rejected her when she returned for him? who else did she love, who tasted her pleasure, who saw her private tears? how did she know to sing as a strategy? how did she choose the song, the pace? how did she sound? when the Civil War started, how did she decide to align her skills with spy work? and had she built relationships beyond her family and those she had freed, the relationships with armed white soldiers who said they were on her side? did she trust them? getting yourself to freedom, experiencing personal liberation, these are crucial acts, but not enough. we have to continue the risk, find the many ways to get each other free. even when there is a price tag on our heads. and it is not enough to know, in detail, how things are unfair. we have to know we are slaves, to see the evolving mechanisms of entrapment, to always keep one eye on the cage and one eye beyond it. we have to be able to show other people when the systems that fill the hours of their lives are stripping them of dignity and agency. we have to be impolite and disruptive. we have to move in the dark, quietly, listening for each other’s heartbeats, learning as we go. we have to be willing to pull a revolver on those who, in their fear, would risk the lives and well being of everyone else. we have to be willing to say we will complete this journey to freedom, one way or another. we have to give our lives to the future that comes through in our dreams. to talk directly to god, to listen directly. to be so much more than we’re told we should be, to be shocking, to be myth, leaving legacy. i am a kresge literary arts fellow. it’s in the free press, detroit news, and metro times, so it’s real in spite of my ongoing shock. i have a lot of thoughts and feelings about it. 1. i am a writer. 2. ‘i can sense it. something important is about to happen…it takes courage to enjoy it.’ – bjork (big time sensuality). 3. i am an artist. i am a singer. i am a writer. 4. for years there has been this undertow. i would move forward in my life as a social justice facilitator, worker, leader. and reach some peak, receive some honor or title or role that honored my work. and there would be this undertow – my artist self. my writer self, wanting to write wild speculative poetic fiction and sci-fi erotica and afrofuturist opera, sing jazz in paris and paint entire worlds made of women’s beauties. then the current would move again and i would be chasing sand, rolling in the familiar rhythm of holding space for others to dream and reach for justice. 5. i thought all this time it was a selfish pull. but it isn’t. 6. i thought i could stave the need to write by blogging. but i haven’t. 7. i want to write more and more. on my sabbatical last year i wrote so much my hands were weary, then i dictated things into the recorder. i wrote poems, songs, memoirs, fiction, science fiction, essays. 8. the most exciting writing was the science fiction. the science fiction pathway has been growing for years, and it’s steeped in the learnings about emergence, it’s steeped in my love of octavia butler, and my love of detroit. it’s steeped in my complex relationship to apocalypse. 9. as i have started to write science fiction, and hold space for others to talk about and write science fiction, i have found a juxtaposition of passions. in this space i get to shamelessly be an artist, while still opening and holding a space for the art of imagination and visioning to spread amongst the people i most believe need to be central in the future. 10. late last year i was awarded the BALLE fellowship to do local living economies work – and i was excited, because it was a chance to advance ideas i am deeply aligned with. but as i got into the experience, surrounded by amazing people i respected, i found it wasn’t quite for me – it was for detroit, but i wasn’t the right conduit to get that radical business knowledge to the city (‘i don’t know nuthin bout birthin no bizness!!’). when i stepped back from that space, it was without knowing what else might come my way, and hoping (praying, doing ceremonies, searching) for some way to still keep roots in detroit. 11. i forgot i had applied, it was such a reach. i am beyond the curve – i have not been writing full time. there are many in detroit who have, and i am so aware of their brilliance and hard work. and i thought i had run out of viable options to stay creating and working in this city i love. i had an absence of purpose. i had eeyore eyes looking around my beloved apartment. i was building up my adaptability muscle to let go. 12. and i thought i might be destined to always write on the side of the work i do as a facilitator. in terms of how i made a living. and i was making my way to being ok with that. kind of. 13. i can think of so many incredible artists in detroit who should receive this award. so many it humbles me. 14. it is kresge, with whom as social justice worker in the D i have had a very complex relationship. this is the foundation that funds everything in detroit in some way, things that move us towards justice and democracy, and things that move us away from it. and i wish there were more black detroiters with me amongst the awardees. i see the whiteness, i see particularly the lack of women of color, black women. they are investing in me, and my intention is to uplift the transformations afoot in this city and play out the potential futures of justice. so the relationship is direct now, and the invitation for accountability intrigues me, challenges me. 15. the money is a major blessing. but even more so is what the people of the fellowship keep saying – ‘we want to support you to become the artist we already see in you’, ‘we will help you learn to connect to resources to be an artist as your life.’ really? really. 16. thank you more than i can fit the words in my mouth to express it. thank you to the panel who felt my writing, to kresge and creative capital and artserve michigan. and to the people who supported my writing all these years, those who funded my sabbatical, to invincible, to my parents, especially my mom who reads every blog post. to my creative partners walidah imarisha and dream hampton, to the sci-fi nerds building community with me. and to the greater force i feel moving in my life, god-is-change, thank you. 17. in the spirit of all of that – i’m going to write. i am going to write as the center of my life! in every way, to the best of my ability, prolifically and unapologetically and as sacred work, work prayer, shaping god. 18. i feel exposed…this feels like a coming out. even though maybe everyone knows how much writing is my center. but i didn’t know it could be honored, that it was that visible mama-i-want-to stuff. i feel like another self, further inside of me, is in the sun. it’s delicious.